This is a guest post I wrote for the Verizon Wireless Midwest Area Blog. The folks at Verizon Wireless were looking for a way to recognize June Dairy Month and highlight ways dairy farmers use mobile technology. One of the first things my husband and I did when we started dairy farming ten years ago was cancel our mobile phone service. We had left our 9-to-5 jobs in the city and would be working together side-by-side. We usually only used our mobile phones to call each other; why would we need them anymore? Fast forward to today and if you asked us to get rid of our phones we’d look at you like you’d lost your marbles. We were able to farm for a couple years without mobile phones, but we quickly realized just how important it is to be informed and connected in today’s world of dairy farming. Everyone seems to think of dairy farming as milking cows, feeding calves, and driving tractor, but there’s also a lot of information management and decision making involved. Our mobile phones help us make decisions and stay on top of changing information. Every morning in the barn, Glen will ask me what the weather forecast shows. Before I got my Verizon iPhone, that would require a trip to the computer in the house. Now, I pull out my phone and I have the forecast at my finger tips. Glen doesn’t have a smartphone, but his phone is no less valuable. He gets daily reports on the quality of the milk we sell via text message from our cooperative. Our phones also help us take good care of our cows. Glen uses his to record information about our cows’ health. I use mine to reference dairy cattle health care sites. 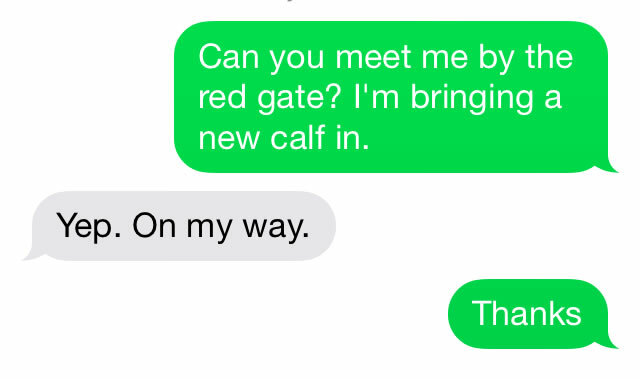 We both use text messaging to communicate with our veterinarians. But the most important job our phones do is keep us connected. We often use our phones like walkie-talkies – to communicate from one end of the farm to the other. If I’m out in the pasture and need help, I can call or text Glen instead of walking all the way back to the yard and then walking all the way back out. The same is true when Glen is out in the field making hay or harvesting crops and needs a hand. My smartphone also helps me connect with people through social media. For a little over a year now, I’ve been using my phone to share photos and stories about life on our farm. I believe I have a responsibility to help people learn more about where their food comes from, but I don’t have a lot of time to spend sitting in front of my computer; my smart phone lets me share our farm life while I’m on the go. I’ve been using my phone to share lots of photos this month in celebration of June being National Dairy Month. I know many of my dairy farmer friends will be doing the same. This is a great time to connect with a dairy farmer through a blog or social media and learn more about dairy farming. I am a Verizon Wireless customer. I was not compensated to write this post. All opinions are my own.